Founded by the Coy family in 1905, Salt Creek Merino Stud is renowned for its product and supplies premium-quality fine merino wool globally. Since 2006, Director and 3rd generation owner Peter Coy has been working with Tilt Renewables and its predecessors to establish a new venture on the property in the form of a Wind Farm generating renewable energy capable of supplying 30,000 homes with electricity per annum. 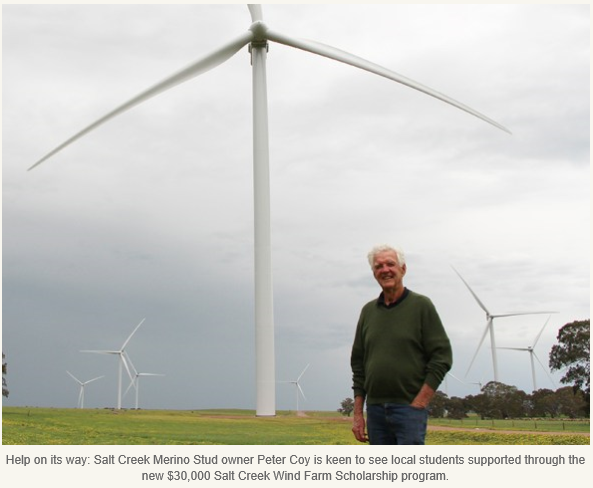 Construction of the Salt Creek Wind Farm commenced in September 2017 and was completed in late July 2018. In recognition of the importance of education in our local community, the Salt Creek Wind Farm has established an annual Scholarship of $30K to a deserving local applicant who can illustrate the benefits the Scholarship can offer him/her. Please find below the link to the Salt Creek Scholarship website, which is now live and accepting applications. All Year 12 students are eligible to apply, including those who are planning on having a gap year and, retrospectively, former students (past 5 years) who have not yet commenced a tertiary course. The ‘Eligibility’ page of our website explains all of this in further detail. As a reminder, please also note that the Salt Creek Wind Farm is open this Sunday 21st October, from 10am – 2pm, should anyone wish to come along.